One of Val Tobin’s current projects started as research on the after-effects of near-death experience (NDE) for her Master of Parapsychology degree (you can read about that in Val’s bio). 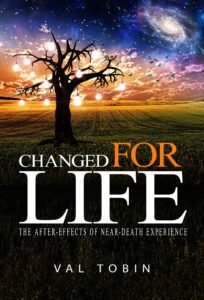 Val Tobin’s Changed for Life explores what happens to those who’ve had a near-death experience after they return to life. As one might expect, their lives are altered. Not only have they been given a second chance at continuing their physical existence, but they are impacted at every other level as well: emotional, mental, and spiritual. Many experiencers return from the event forever changed, and the effects aren’t limited to those who’ve had the experience. Friends, loved ones, and anyone hearing the stories experiencers tell can be affected as if they’ve had the experience themselves. Whatever the truth about the experience itself might be, there is no denying that changes occur on multiple levels. The results are positive if the experiencer is able to process the event in a healthy way. However, some experiencers have difficulty integrating the changes into their lives, which can adversely affect relationships. The loss of a fear of death is one of the most common changes, as is a refocusing of values. Where previously a person might have been materialistic and driven by a pursuit of wealth and status, after the experience he or she would be more focused on love and spirituality. Moody reports in his book The Light Beyond that people change after such an experience, not because a being ordered them to, but “because they are in the presence of the standard of goodness, which makes them want to change their behavior radically” (39). This distinction is important because it illustrates that the alterations to behavior are internally driven. Experiencers act differently because they believe differently and not because they think they’ve been given some kind of Divine directive. Stay tuned here for updates on this important non-fiction release. Some readers disliked that the creatures in Storm Lake weren’t vanquished, and Rachel, Jeff, and Peter were left in an uncertain future. 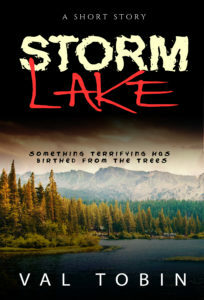 The idea for Storm Lake originally evolved from a creepy thought Val Tobin had when she was a teenager visiting her parents’ cottage near Bancroft, Ontario. In the springtime, the trees were bare of leaves and looked skeletal. Some had enormous burls — deformed growths on the tree trunks that resembled pregnant bellies. Naturally, Val envisioned alien creatures gestating inside that would eventually birth themselves and run amok in the wilderness. 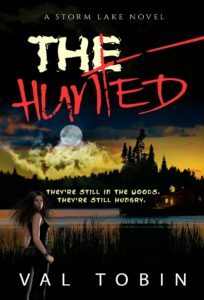 The idea haunted her for a couple of decades until she finally wrote a short story about it. Storm Lake is a fictional lake in Ontario, but it’s based on the lovely, secluded lake of Val’s past (and present — the cottage remains in the family). Val originally intended to show a slice of Rachel’s life. How would a child deal with this situation? Could she find a way to save herself? How far would she go to save her brother? Siblings often clash, but underneath it all, they love each other and would do anything for each other. The story focuses on this bond between Rachel and Jeff and also on the bond that can form between strangers who come together in unbearable circumstances. But it was meant to be open-ended. The circumstances at the end would be Rachel, Jeff, and Peter’s new normal. Once these characters demonstrated that they could collaborate and triumph under the most horrific conditions, it’s up to the reader to extrapolate from there what their future might be. Do they make it to Peterborough? What awaits them there if they do? Where’s Rachel’s father and why can’t she reach him? The answers to these questions were meant to be moving targets. What Really Happens to Rachel, Jeff, and Peter? Dear reader, is your glass half full or half empty? If you believe the story ended with hope, you’ll answer one way. If your glass is half empty, you’ll believe despair awaits them, and you’ll answer another way. The author’s take on it shifts as well. At times, Val believes everything will be all right for the trio. At other times, she believes they are doomed. Perhaps that’s a reflection of what’s happening in society at the time. Apparently, many readers would prefer to know for sure, and after a decent interval since the story was published, the three characters are pestering Val to provide an update. They demand a resolution to their story, and they intrude on Val’s thoughts at odd times throughout her day with glimpses of what’s happening. This fall, one of Val Tobin’s current projects will be to return to Storm Lake and complete the journey with Rachel, Jeff, and Peter. Val will give more talks, attend more book signings, and participate in more events throughout the remainder of 2018 and into 2019. 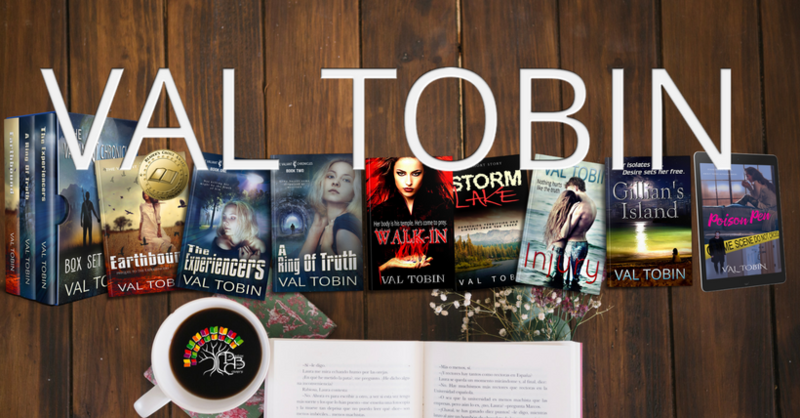 To keep updated on where you can find Val and her books, check the “Meet Val” page regularly or subscribe to her newsletter (use form on left) or blog.